New York State Governor Andrew Cuomo issued an executive order on Thursday directing the establishment of a health insurance exchange, an online marketplace where individuals and small businesses can shop for competing health insurance plans. Barring a successful challenge, the order will bring to New York the health exchange that President Obama’s Affordable Care Act requires of each state by 2014. Unable to garner enough support in the state senate to put legislation through, Cuomo opted to do it solo. Some state lawmakers are ticked off by Cuomo’s action, citing, among other things, that the fate of Obamacare itself is currently being debated in the chambers of the Supreme Court. “Enlisting our state in a program that may cease to exist on both constitutional and administrative grounds is, in my opinion, overly aggressive and fundamentally imprudent,” said Republican state senator Gregory Ball. The order will make New York the twelfth state to create a health exchange per the Affordable Care Act requirement. New York joins Rhode Island as the only states to do so by executive order rather than by legislation. 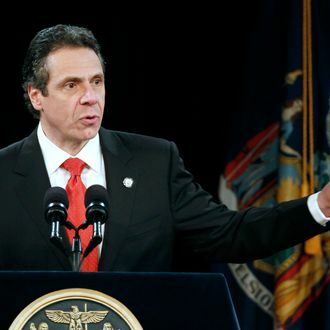 Mr. Cuomo’s office defended the use of an executive order, noting that the state would rely on federal financing to set up the exchange, rather than any new state spending, and that it would not set up a new governmental body. New York has already received $88 million in federal grants to plan for its health exchange; setting up the exchange will allow the state to seek additional federal financing.